The Redmi 4A has a 5.0-inch 720p HD display, and has a polycarbonate body and a matte texture. The phone runs on MIUI 8, and is powered by a 64-bit quad-core (A53 x 4) Qualcomm Snapdragon 425 processor clocked at 1.4GHz, with 2GB of RAM, an Adreno 308 GPU and 16GB of internal storage, and a micro SD card slot for expandable memory. And as you may have guessed this memory card slot, is part of a hyrbid dual-SIM slot. The phone supports 4G VoLTE out of the box. The main photography option on the Redmi 4A is a 13 megapixel rear camera, with a 5-element lens, with an f/2.2 aperture, and an LED Flash. The selfie lens is a 5 megapixel front camera, also with an f/2.2 aperture. The Redmi 4A packs a 3140mAh battery, which has a standby time of up to 7 days. The phone is quite slim at 8.5mm and weighs just 131g. 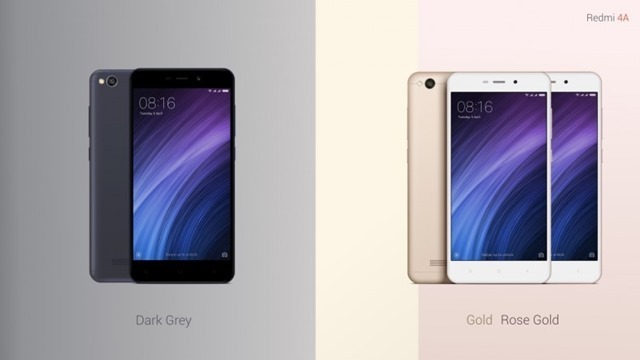 The Redmi 4A will be available in 3 colours: Rose Gold, Dark Grey and Gold. The Redmi 4A has been priced at Rs. 5,999, and will be available for sale from Amazon India and Mi Store at 12 noon, on 23rd March. Xiaomi says that the Redmi 4A is Made in India, and that its facilities are manufacturing 1 phone a second.